Are you curious to discover more about yourself? Your genes determine who you are. Do you like to play it safe or are you more of a risk taker? Do you plan things out or are you more spontaneous? The Personality DNA test can help you learn more about how your genetics affect your personality and behaviour. A simple saliva sample is all that is required to unlock the secrets behind what makes you unique. Order our test today! What is the Personality DNA test? 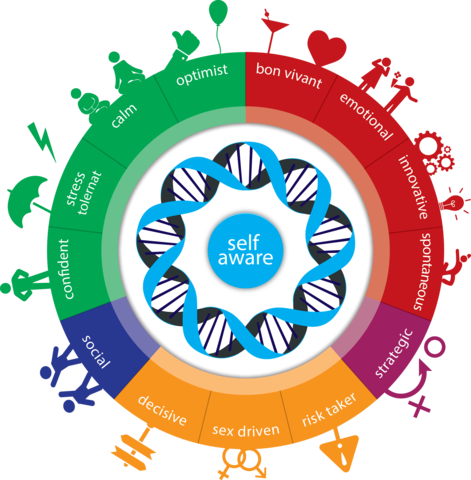 The ‘Karmagenes’ Personality DNA test is a ‘Behavioral Genetics’ DNA Test which makes use of the latest in DNA sequencing technology to provide you with a combined nature (genetics) and nurture (advanced psychometric tool) analysis of the elements shaping your personality and behavior. Starting from $195, our test can help you learn how your genetics affect your behavior in different situations from stress management to sociability. Discovering more about what makes you a unique human being starts with just a simple saliva sample! The DNA modifications that the DNA test score for, Single Nucleotides Polymorphism (SNP), are extracted from scientifically peer-reviewed research papers available in the United States National Library of Medicine (NLM) at the National Institutes of Health called PubMed. This test is based on Karmagenes i5, a tailored psychological assessment tool built by professional psychologists covering the core values of the most used and accepted personality paradigm, the big 5 dimensions of personalities known simply as the “Big Five”. The five-factor model covers five basic human personality traits (regardless of language or culture) derived from a statistical analysis of traits that co-occur in people’s descriptions of themselves or other people. The Big Five is currently the most used and accepted personality model to study personality in terms of how it changes over time and how it relates to other variables. The Personality DNA test makes use of a proprietary algorithm to build your personalized profile based on the information obtained from the tailored Karmagenes i5 psychological assessment and the 14 different behavioral characteristics extracted from the DNA sample. The test’s proprietary algorithm is constructed on a polygenic approach that links SNPs and Genes with the 14 different behavioral characteristics in a unique, novel and accurate manner. Behavioral Genetics or Behavior Genetics is the study of genetic and environmental influences on human behavior. By examining genetic influences, interesting and essential information can be discovered about how the environment affects our different behaviors. Almost all the behaviors studied by psychologists are influenced by our genetic make-up meaning that the question is not whether genes are important but how do they affect our behavior? Thanks to thousands of studies using many different methodologies we now know that both genes and environment need to be studied if we hope to untangle the mysteries of any behavior. Read more about the science behind this DNA test and the evolution of Behavioural Genetics studies. Results can be available in as little as one to two weeks and are presented in a comprehensive, full-color 21 page report. Take a look at the sample report of this test. For an additional $75 you can find out even more about yourself! If you decide to opt for this upgrade, you will be provided with an extended report including personal advice about your career, relationships and well-being based on your DNA scores and psychological profile. View a sample of the extended report. EasyDNA’s product portfolio includes other personalized health DNA testing services which you might be interested in ranging from Diet and Health DNA testing (weight management) to DNA testing for skin care (skin treatment and care). Get started on your DNA testing journey today to find out more about yourself!